Last night, I went out for wing night at a nearby restaurant/bar. I haven't had wings in so long! Well, I found this recipe on Midwest Living, for Jamaican Jerk Chicken Wings -- yummm! Cut off and discard tips of chicken wings. Spread the remaining wing portions open. With a sharp knife, carefully cut each wing at its joint into two sections. (You'll get two finger-lickin' pieces per wing, making 24 pieces total). Place chicken wing pieces into a resealable plastic bag set in a shallow dish. For marinade: In a small bowl, stir together Jamaican jerk seasoning, vinegar, orange juice, lime juice, olive oil and soy sauce. Pour marinade over chicken wings; seal bag. Marinate in refrigerator for 4 to 24 hours, turning bag occasionally. Drain and discard marinade. For a charcoal grill, grill chicken wing pieces on the rack of an uncovered grill directly over medium coals about 20 minutes or until chicken is tender and no longer pink, turning once halfway through grilling. (For a gas grill, preheat grill. Reduce heat to medium. Place chicken wing pieces on grill rack over heat. Cover; grill as above.) (For broiler, place chicken wings on the unheated rack of a broiler pan. Broil 5 to 6 inches from the heat about 8 minutes or until light brown. Turn wings. Broil for 8 to 10 minutes more or until chicken is tender and no longer pink.) Serve with salsa. I definitely hope to try this recipe soon. I prefer mainly buffalo, BBQ, or teriyaki wings. What kind do you like? Such a perfect summer food! I love jerk chicken and this recipe looks super easy. I always feel like chicken wings are so much work for just a little meat. I do make exceptions for a good one though and the salsa looks delish! Oh man, my mouth is watering. I LOVE wings and I love anything jerk, so this looks like an amazing combination! I may make this with veggie meat, still looks delicious! Great recipe! -xo Have a great wkd. What a tasty dish! The chicken looks tasty. 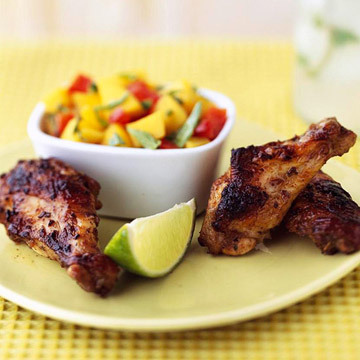 I have never tried jerk chicken wings before but the recipe looks really good. Thanks for sharing. Love watching cooking shows and tv but not quite sure whether I love cooking or saying this line. Never tried this one and never heard of it also still looks yummy. Such a delicious looking dish! Thanks for sharing this recipe! This looks so amazing and perfect for summer! oh my gosh, these sound AMAZING!! Thank you for sharing the recipe! Your wings look so delicious!!! Would you like to follow each other?